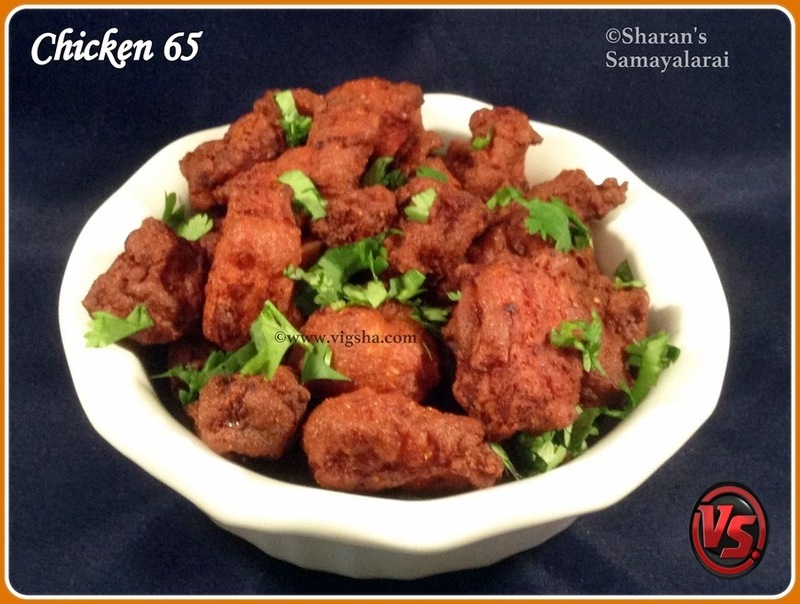 Chicken 65 is one of the most popular and delicious Indian appetizer. They are crispy outside while juicy/soft inside. Perfect chicken 65 depends upon the marination time and the frying method. Everyone would have tried this recipe in their own version.. I am going to post my version today with some tips.. There are many different stories for how the name came about - Chicken is marinated for 65 days and then deep-fried, there are 65 ingredients used in making it, 65 chillies were used for every kg of chicken, Chicken is made into 65 small pieces so that all can eat it easily. I am not sure if it is true, but, I am sure everyone will love to taste this mouth-watering recipe. 1). Clean and cut the chicken into bite size pieces. Marinate the chicken piece with all the ingredients listed under"for marination", until the chicken is evenly coated . Cover using a cling wrap and marinate the chicken in the marinade for at least 2 hours / overnight in the refrigerator. 2). Bring the chicken to room temperature and heat oil for deep frying. Once the oil is hot, gently add the marinated chicken pieces one by one in small batches without overlapping and crowding the pan. 3). Let the chicken pieces cook for about 3-4 minutes undisturbed until the bubbles starts to come down. Deep fry them tossing continuously until crispy and it turns golden brown. Check if the chicken is done by taking out couple of pieces. Drain and place on a paper towel to drain the excess oil. Repeat with rest of the chicken pieces. Squeeze fresh lemon on the chicken pieces and serve with sliced onions. # Yogurt/Curd is an essential ingredient in the marinade, it gives texture and flavor to the chicken. # Allow the marinated chicken to rest for at-least 2hours. The more it is marinated, the softer the chicken will be. # Cook in the medium flame so that the chicken turns crispy outside, but moist and soft inside. # Kashmiri chilli powder gives a good color and is mild in spice level compared to normal chilli powder. If you do not have it, use normal chilli powder with a pinch of food color, adjust the quantity. # Make sure to keep the marinated chicken pieces covered. Over cooking them can make it hard and chewy, make sure to keep it juicy and moist. # After frying the first batch the oil temperature will come down. Make sure it reaches the correct temperature before frying the next batch.